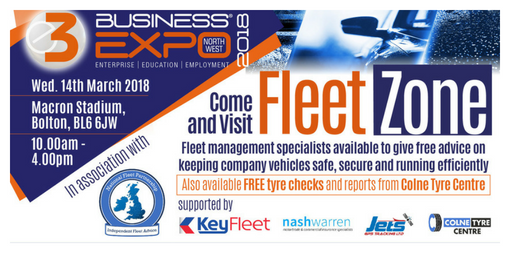 1 Events Media, the host of the E3 Business Expo 2018, has assembled a panel of fleet management specialists to give visitors free advice about keeping company vehicles safe, secure and running efficiently. The Expo will take place on Wednesday 14th March at the Macron Stadium in Bolton. The one-day event will run from 10:00am to 4:00pm and will feature a series of business seminars, speed networking opportunities and an exhibition hall with over 70 stands. Entry is free. The Expo will feature a programme of short seminars running throughout the day. One of these will be delivered by the National Fleet Partnership, a newly launched association of companies whose expertise covers the whole gamut of fleet management. The seminar will take the form of a panel-based question-and-answer session, with experts on hand to discuss everything from safety checks and vehicle security to leasing and insurance. The panel will include Jan Evans, director of Jets GPS Tracking, a specialist consultancy that assists clients with vehicle tracking, onboard CCTV, purchasing decisions and a host of other concerns. Alongside him will sit Azhar Iqbal, MD of Colne Tyre Centre, who will take questions on subjects including safety, maintenance and servicing. The other panel members will be Chris Phillips, Head of New Business & Development at Nash Warren Insurance Services, and Marc McLoughlin, MD of fleet management and vehicle funding specialist Key Fleet. “The National Fleet Partnership is a new group that seeks to offer free advice to north west businesses,” explains Jan Evans. “The E3 Business Expo marks the organisation’s formal launch, and it will be the first in a regular series of events at which members will offer free information and support. Our members are all experienced, trusted suppliers who want to guide firms through the fleet management minefield. Besides delivering the seminar, the National Fleet Partnership members will also be exhibiting in the Expo’s Fleet Zone. Here, throughout the day, delegates can get advice on all vehicular matters. Delegates can even get help outside in the stadium car park, where Colne Tyre Centre will be offering free tyre checks and vehicle reports. In addition to providing extensive coverage of fleet management issues, the Expo’s seminar programme will cover a number of other critical topics for managers. Running throughout the day, the free half-hour sessions will examine topics including referral partnerships and customer engagement. Details of the Fleet Zone, the exhibitors, the seminar programme and visitor registration can all be here.